Some lizards escape predators by "dropping" their tail, but the experience appears to leave its mark. After losing their tail, lizards end up with damaging changes to their DNA. The parts affected are the telomeres – stretches of DNA that cap the ends of chromosomes. Telomeres naturally shorten as cells divide, and shortened telomeres are associated with the effects of ageing. In humans, shortened telomeres are linked to increased risk of heart disease and dementia. 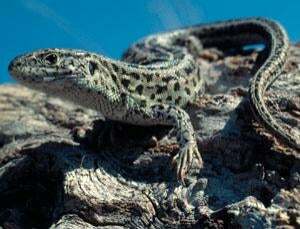 The changes in the telomeres found in lizards that have experienced a close call adds to the evidence that environmental stress has negative effects by eroding telomere length. To better understand this, Mats Olsson of the University of Wollongong in New South Wales, Australia, and colleagues measured the telomeres of wild sand lizards, Lacerta agilis. They found that telomere length was affected in animals that had dropped their tails to escape attack – especially in males. Lizards that had been attacked recently were more likely to have shorter telomeres, and this effect was stronger in larger males than in both smaller males and females. Larger males live more stressful lives than smaller males: they have more contests for female partners and are attacked by more predators. They also have higher levels of corticosteroids than smaller males. The larger lizards reap the reward for their efforts by having greater reproductive success. Losing their tails, reduces lizards' future survival chances because the regrown tail is an inferior version of the original: it contains no bones, only cartilage, so can't be dropped again. Losing their tail also prompts a shift in behaviour, as the lizards adopt a less active lifestyle. "Males 'in the fast lane' would be predicted to become more stressed during the mating season, and that is exactly what we see," says Olsson. Females, on the other hand, naturally live a quieter life, under relatively little pressure from predators compared with males. "Telomere shortening is a more tangled pattern than previously thought," says Steve Donnellan, a molecular biologist at the South Australian Museum who was not involved in the work. We know the rate of telomere loss varies greatly between individuals, and that stress has a role, but we don't know specific factors, Donnellan says. "Here the researchers have identified the very specific causes of stress, seen in males as opposed to females." This article by Wendy Zukerman appeared in New Scientist.